Merica Labz Patriot's Whey - LEGIT Chunks of Cereal Inside! Add 1 scoops wto 6-8 ounces of cold water (according to preferred thickness and flavor) and shake or stir until mixed. This product is only intended for use in healthy adults 18 years of age or older. Pregnant or nursing women should not use this product. Consult your healthcare provider before using this product, especially if you are taking any prescription, over the counter medication, dietary supplement product, or if you have any pre-existing medical condition including but not limited to: high or low blood pressure, cardiac arrhythmia, stroke, heart, liver, kidney or thyroid disease, seizure disorder, psychiatric disease, diabetes, difficulty urinating due to prostate enlargement or if you are taking a MAOI (Monoamine Oxidase Inhibitor) or any other medication. Discontinue use and consult your health care professional if you experience adverse reaction to this product. Do not exceed recommended serving. Do not use if safety seal is broken or missing. Keep out of reach of children. Patriotic Protein! Legit Chunks of Cereal in Your Protein! Check out our Patriot's Whey review - holy hell this stuff is amazing for those of you who can handle pure whey concentrates. And if you can't, just add some lactase and try it anyway!! It's often said that George Washington could not tell a lie. 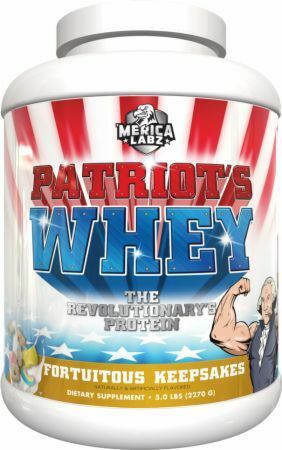 In the spirit of Ol' Georgie Boy, neither can we: Patriot' s Whey is the best-tasting protein this side of the Revolutionary War. This ain' t your dad' s protein – the one that tastes like George' s wooden teeth. This is good ol' fashioned American exceptionalism bottled and packed into deliciousness.